Gail and her husband, Don, know their money is safe—and they know it’s growing—because they invested in a CD with Texana Bank. They don’t worry, because Texana has been a steady presence in the communities it serves for more than 100 years. It’s here today, and it will be here tomorrow. Visit one of our branches in Texarkana, Longview, or Linden before the offer expires. 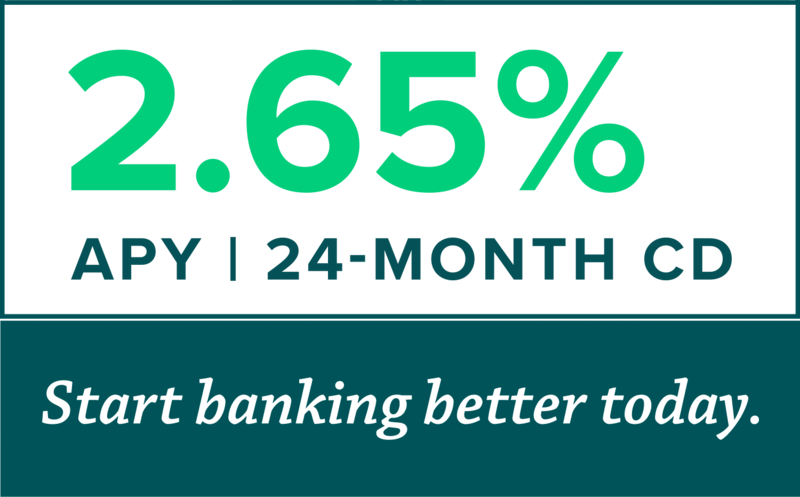 *APY = Annual Percentage Yield. APY is for 24 months (term of the CD) and is subject to change at maturity. The minimum to open and obtain the APY is $1,000. Withdrawal of interest will reduce earnings. A penalty will be imposed for early withdrawal. Refer to Truth-in-Savings disclosure for complete details. Available for personal and business accounts. Promotion available for a limited time only. New deposits only.